Blueberries grow in clusters and not all the berries ripen at the same time. One cluster may have ripe fruit, unripe fruit and green fruit. So take your time when picking! Blueberries begin to turn color before they are fully ripe. A berry may look ripe, but if you turn it over and the stem end is still red or green, it is far from ripe. 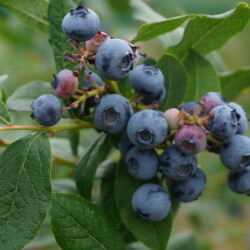 A fully ripe blueberry is deep blue, even near the stem. Unripe berries will not ripen further after harvest, so avoid the unripe ones to get those sweet berries that you are looking for! Other berries are available to pick throughout the season, starting with strawberries, continuing with raspberries and blackberries and then fishing up in the fall with kiwi berries and our fall crop of raspberries. Head to our blog for blueberry recipes like this recipe for classic blueberry muffins, this one for blueberry salsa, or this one for blueberry chutney, from Phoebe’s Pure Food.